This project was a complicated addition to an existing metal building in a working winery. The existing barrel storage building was a typical agriculture metal building which was central to the operating winery. 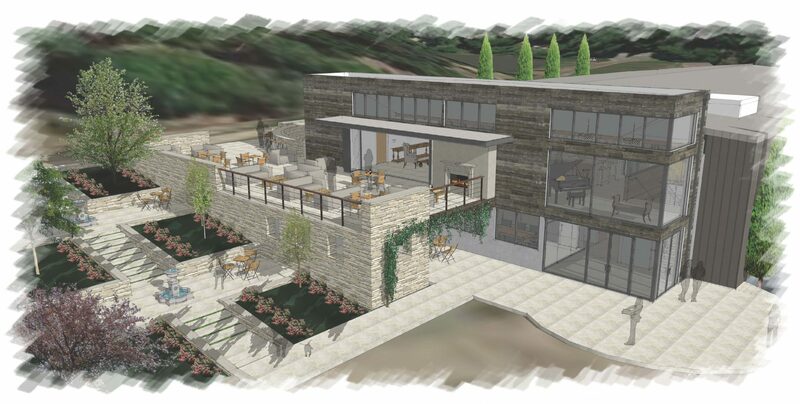 Our charge was to create a destination tasting room on the north end of the existing building (to take advantage of the tremendous views of the vineyards) while also not physically connecting with the existing metal building due to structural seismic constraints. Our solution was to cut a large hole in the end of the existing building, slide two floors of program into the end – office spaces below, tasting room and outdoor patio above. The tasting room breaks free of the metal building and engages the view, creating a strong connection to the outdoors and surrounding vineyards. The material palette of the project was meant to echo the simple elegance of the wine: stone, steel and wood.